More coolness ! Thanks ! 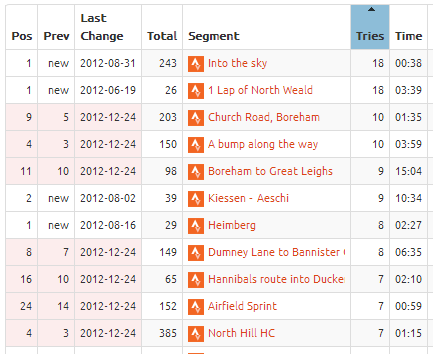 Out of curiosity – who on VeloViewer has ridden a particular segment the most time? And where is that segment? Hi, Any ideas why the data only displays ? rather than number of tries ? I think you might need to visit the activities page first to let it populate those values prior to visiting the segments page. If you come direct to the segments page then for performance reasons I don’t pull down all the data I need to work out the number of tries.